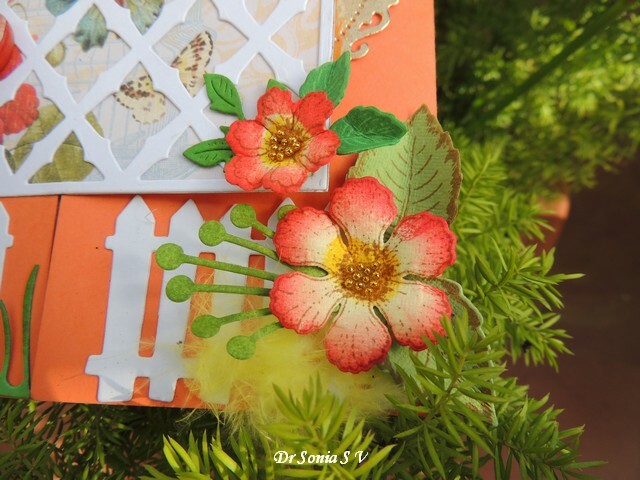 Hi friends I needed to make a birthday card to mail to a blogger friend.This is a Gate fold card in a garden theme with fluttering butterflies and handmade flowers ! 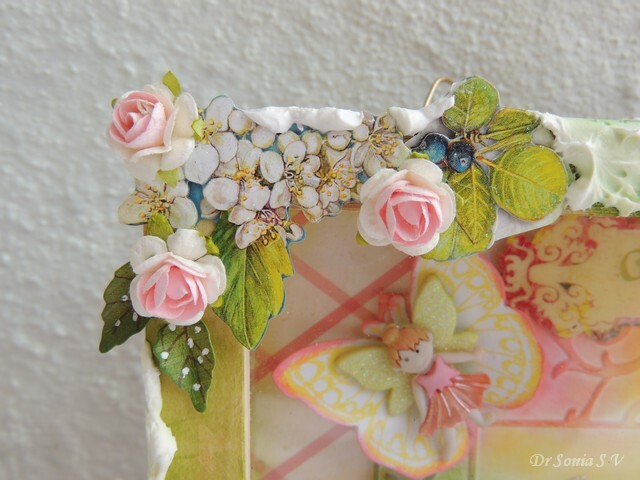 All the handmade flowers were stamped and die cut using Heartfelt creations Botanical rose -wings. 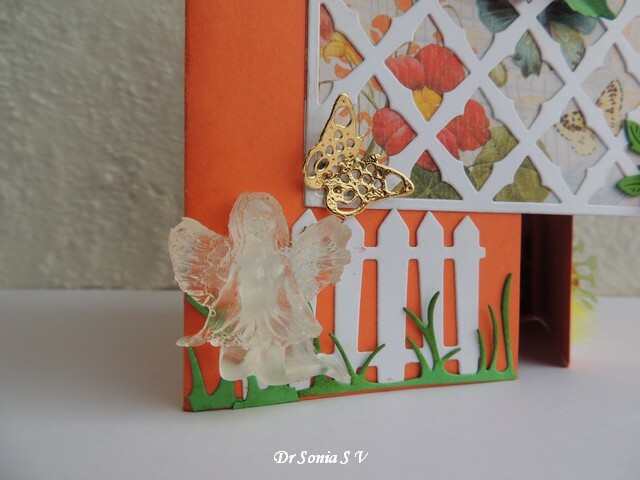 I couldn't resist adding my handmade resin fairy to the garden! 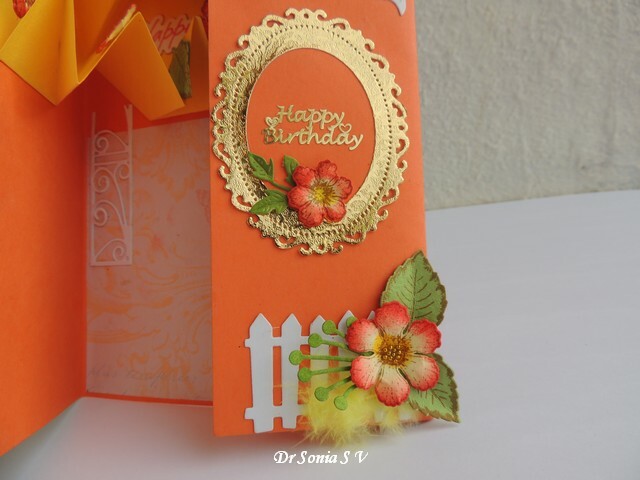 On opening the front flap of the gate-fold card there is a framed "Happy Birthday"
The orange of my base card is rather bright but I do hope my blogger friend is cheered up seeing such bold bright colors! I hope you enjoyed visiting me! 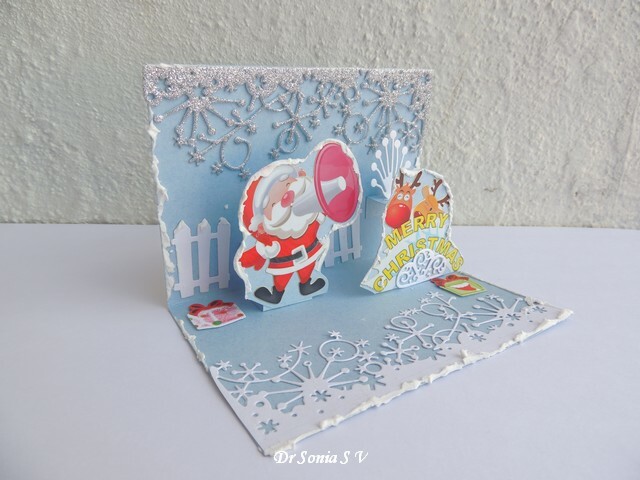 Hi friends sharing a simple Pop Up Card for Christmas. 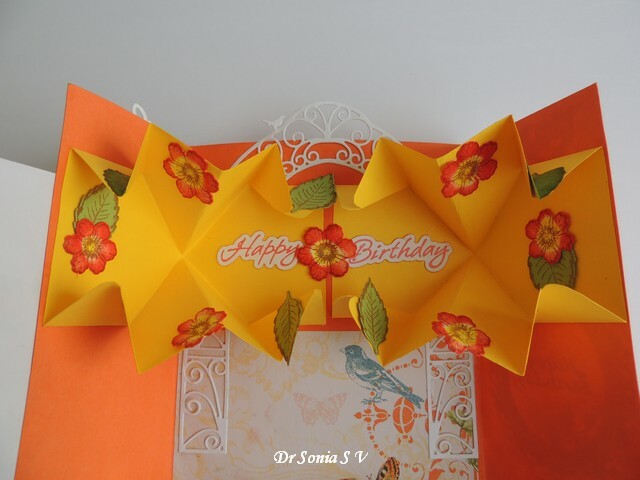 I had made the pop up mechanism some time back so decorating it didnt take much time. 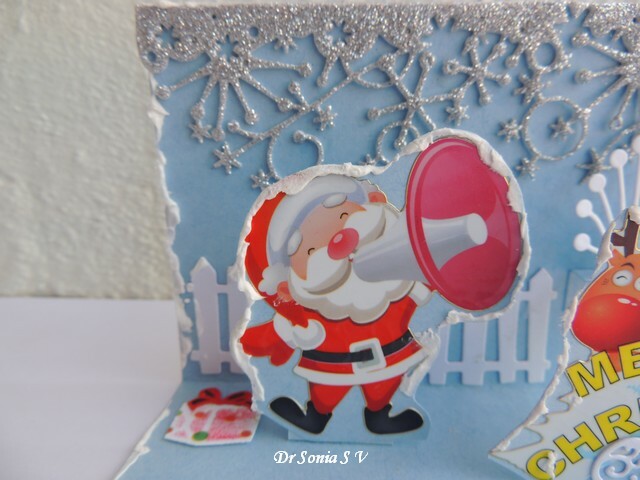 Who doesnt love Santa ? 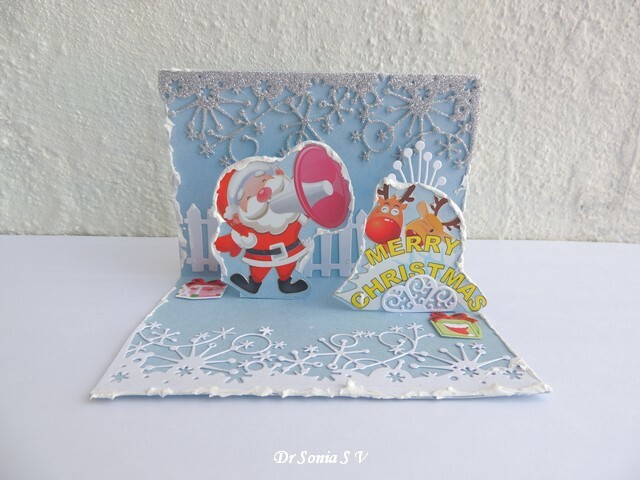 I dressed up this Christmas Pop Up Card with snow using Whipped Spackle. I like Whipped Spackle much more than Snowtex[ seen here : Christmas Diorama] as its easier to apply , doesnt flake off and is not crushed! 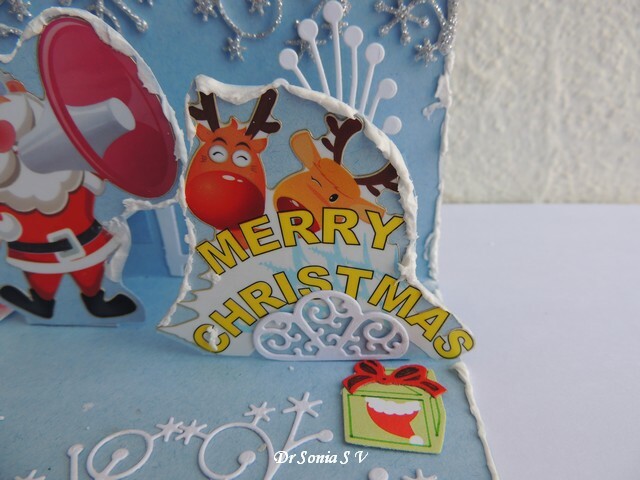 Both the Santa and the reindeer are stickers...I love using stickers in my cards! 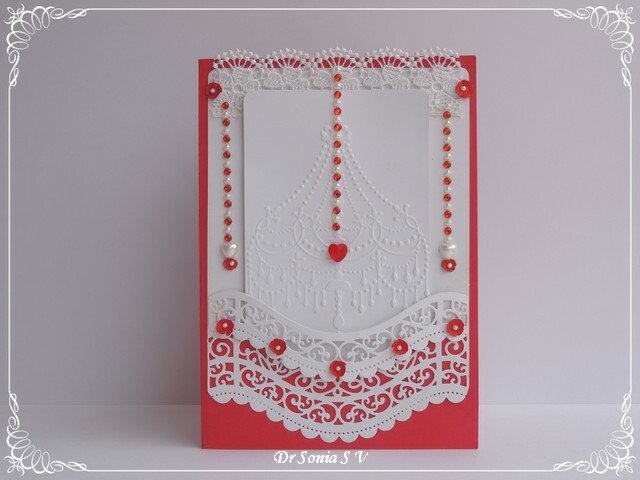 Dear friends sharing a simple embossed card with white on white and dollops of red ! 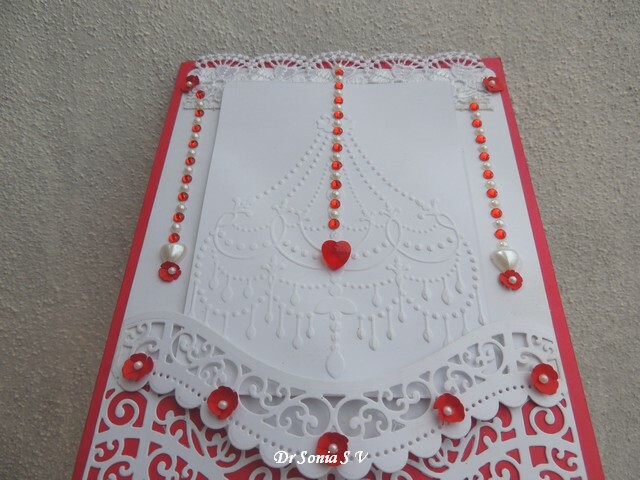 The star of the card is a Chandelier embossed using a Sizzix folder and I added pearl and rhinestone strings to hang on and beside the chandelier. 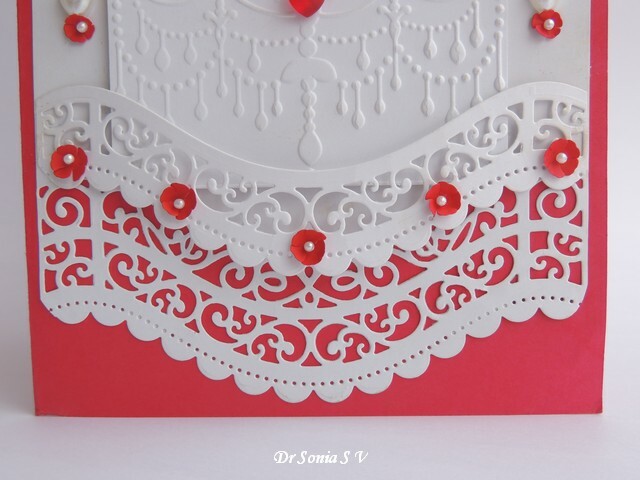 The little red flowers are Cheery Lynn die cut flowers and I added tiny pearl centers on them! 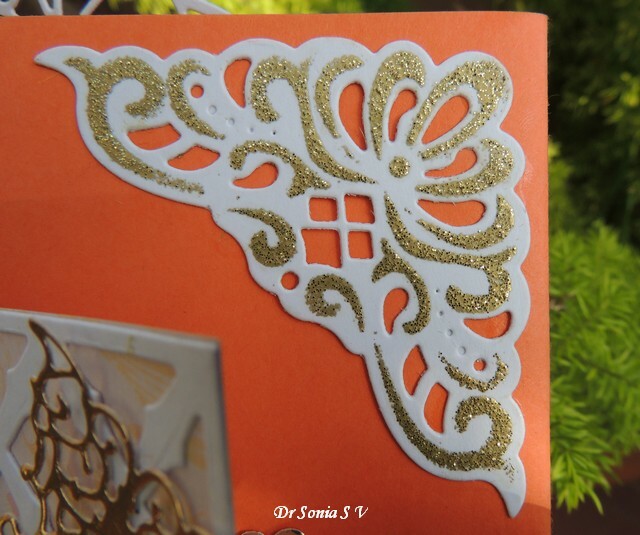 The Spellbinders curved borderability is one of my favorite dies though it is time consuming to poke out all the intricate pieces! 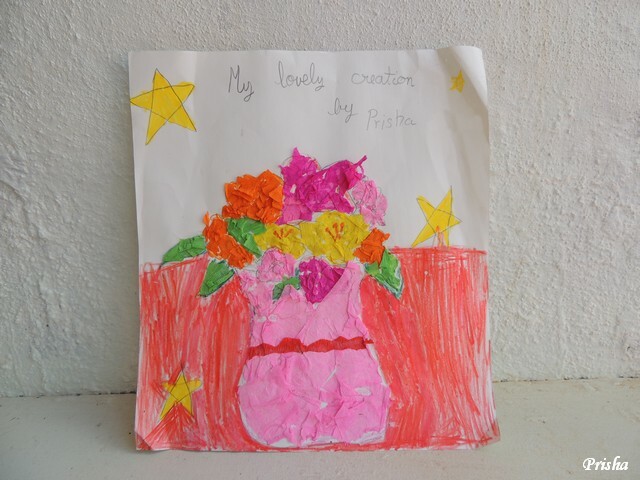 Dear friends Thank you so much for being so kind and encouraging on my posts sharing my daughter's crafts. 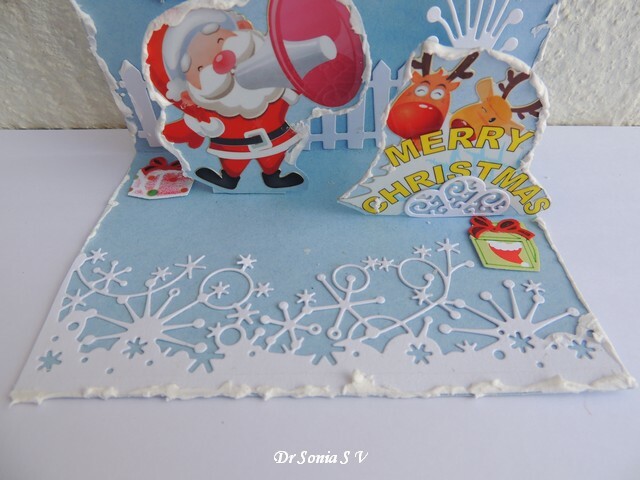 Sharing yet another of my 9 yr old's crafty projects.....this one is a collage art ! 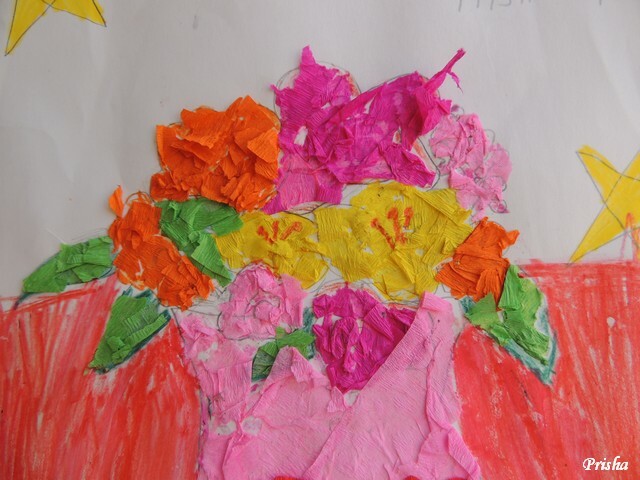 What I especially loved were the bright colored crepe paper flowers in her vase! Also you gotta love those little orange flower pollens she drew for her yellow blooms. 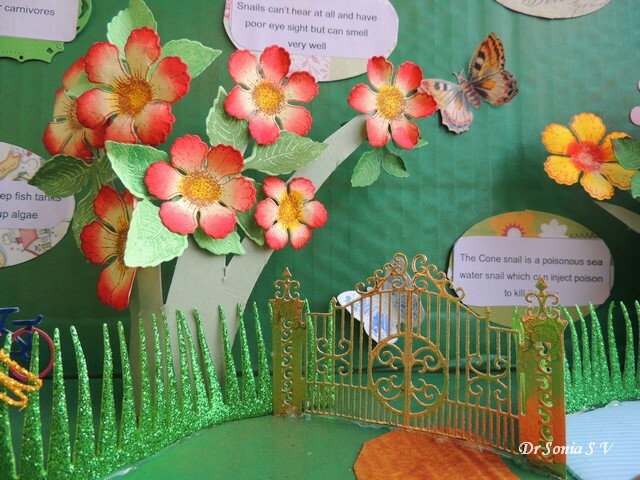 This project was featured by Nana of 2 Creative Chicks. Thank you so much Nana for encouraging young talent! 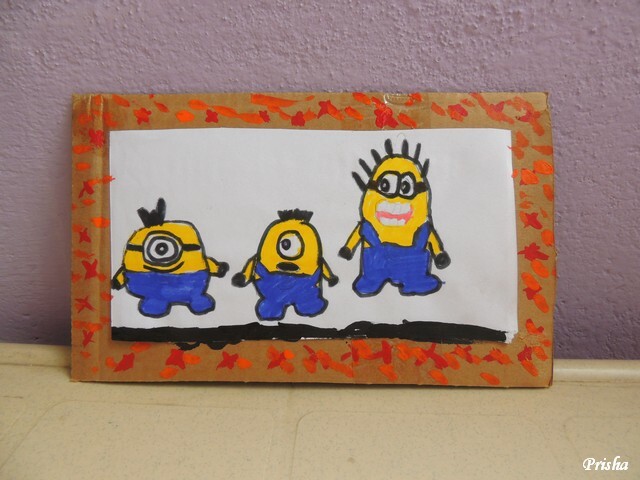 Minions seem to be all the rage these days and my daughter too has joined the bandwagon making a multitude of minion themed crafts! She asked my help to cut a cardboard tube up and she "designed" her cardboard tube minions to house her pens and knickknacks!She even made loom band necklaces for all her minion characters! I have not seen the movie so cant quite fathom the charm of the one- eyed fellas but the 2 eyed toothy grinning fella she painted does make me smile! 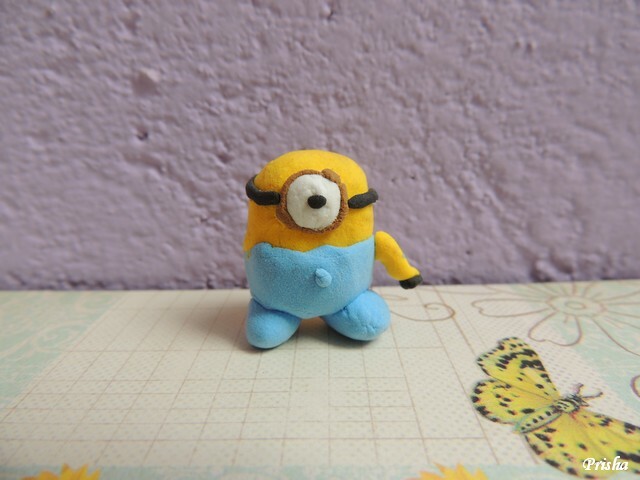 My daughter has quite nimble hands with clay and I guess this clay minion does look rather cute even though he has only one eye , minus an arm which fell off! 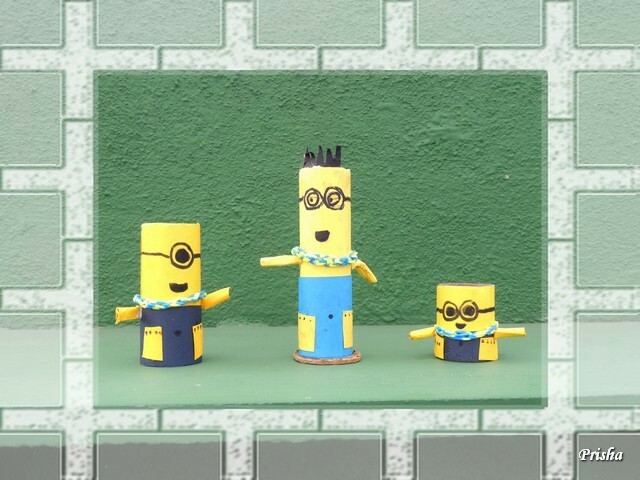 Have you made any minion crafts too? If so do tell me ...!! 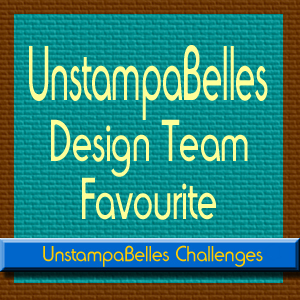 Since I am feeling much more cheerful and happy finally [Thank you so much my blogger pals-- your supportive comments helped a lot to cheer me up!] 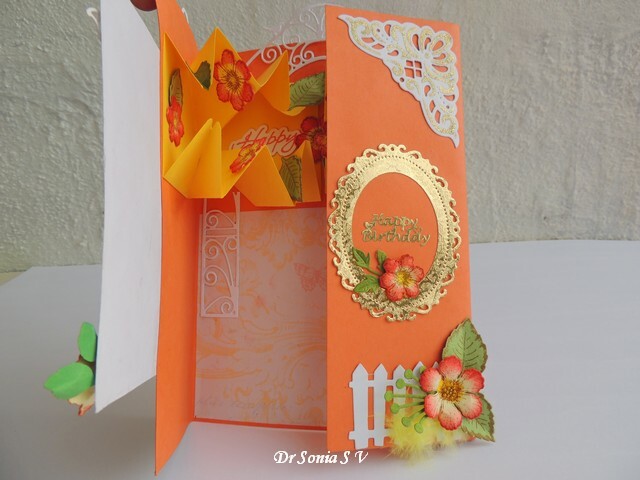 ,I wanted to make a crafty project which was so colorful and cheerful it would chase away any blues ! 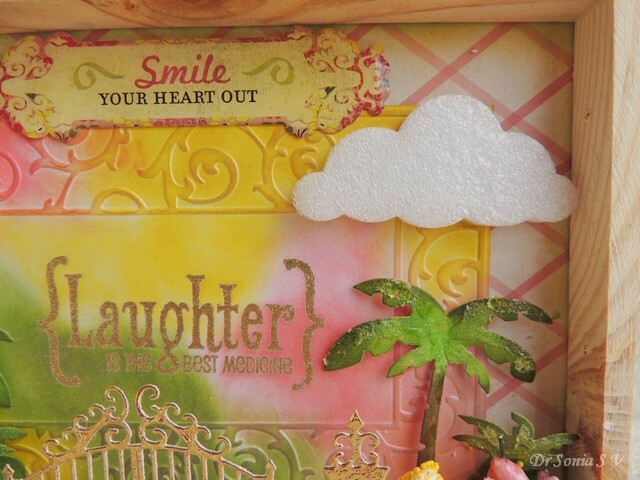 I built a shadowbox around the theme " Smile your heart out" the sentiment on an epoxy sticker my friend Lisa sent me! Everybody has cloudy days and so I added a cloud [ cut from packaging sponge] just to remind one that eventually the sun will come up ! 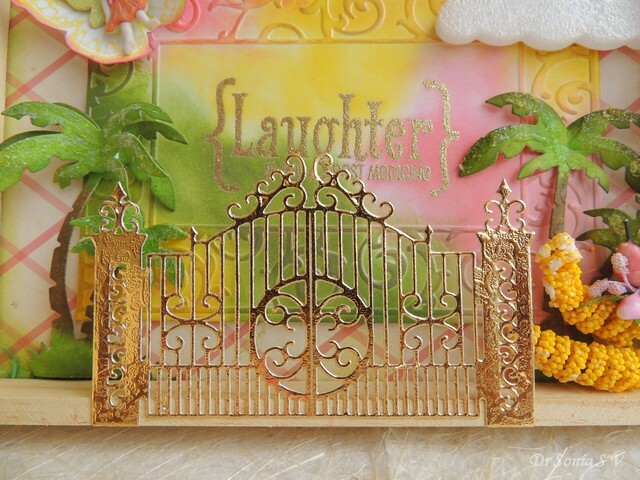 I embossed the sentiment " Laughter is the best medicine" in gold and I bet you agree that many a times Laughter is certainly the best medicine! Yes believe me as a doctor I see that all too often...the power of ones emotional state and positive attitude can work wonders! Last month we operated on an 86 yer old man with advanced cancer of the larynx[ voicebox]. 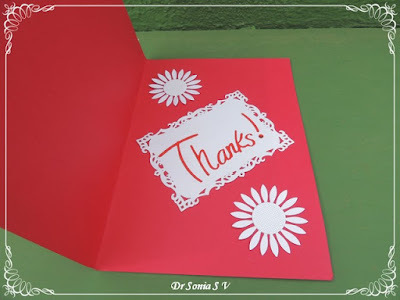 His postoperative period was so turbulent as his aged body struggled to heal and at times we even regretted having given him the option of surgery even though that was his best chance! But in all these years we have not seen such a fighter...he was just raring to go back home and I think his positive attitude did more wonders than anything we did and he was soon able to join his grandchildren at home beating the deadly disease and the turmoils of its treatment! 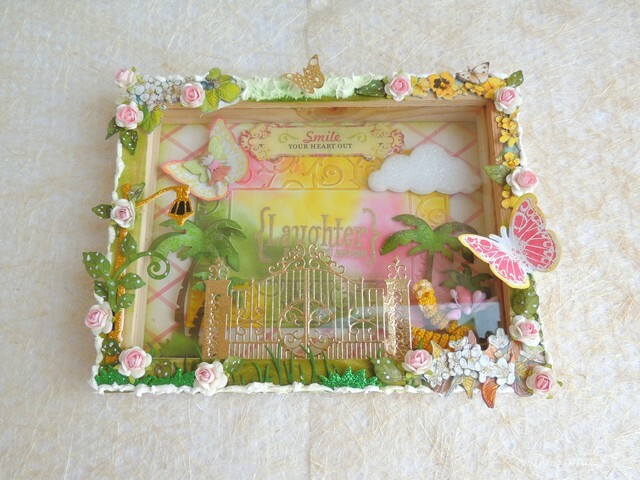 My shadowbox has a dominance of bright pink and cheerful yellow with oodles of greenery too! 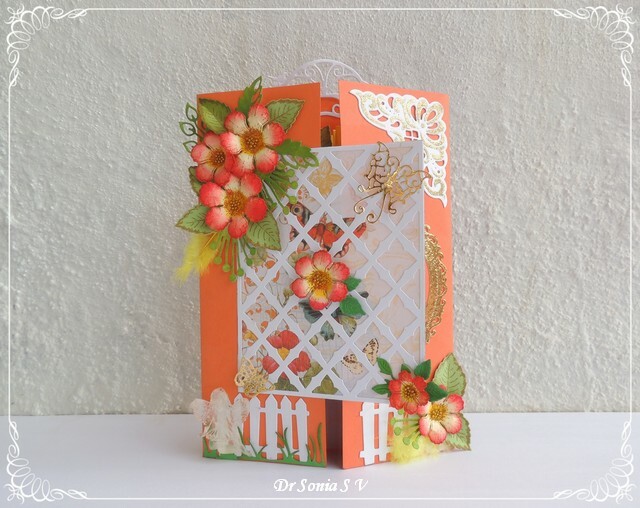 The embossed frame was sponged with distress ink and dusted with pearl powders for a gorgeous shimmer. Everyone has a guardian angel to look over them dont they. I am not deeply religious in the temple going- daily praying fashion but I do believe someone watches over us! 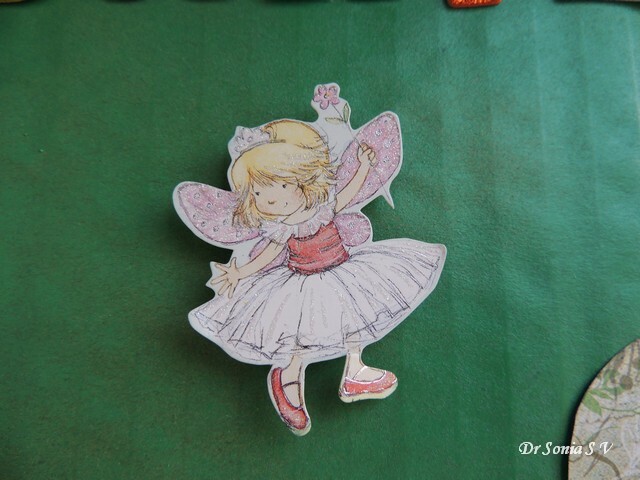 And anyway the little fairy looks too cute to not smile!She is actually a button I stuck on an stamped- die cut butterfly! Well what else can make one smile...something that reminds you of a holiday ...palm trees on sandy beaches..or more accurately coconut trees in my case as they remind me of my hometown of Kerala ! 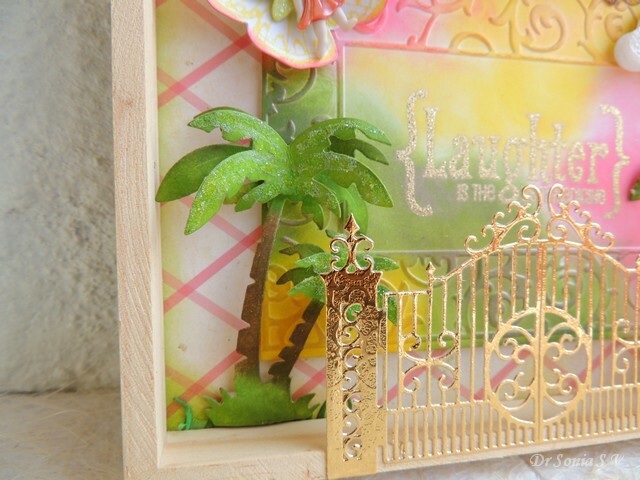 The coconut trees are Spellbinders die cuts and inked in distress ink and glittered over with distress glitter. 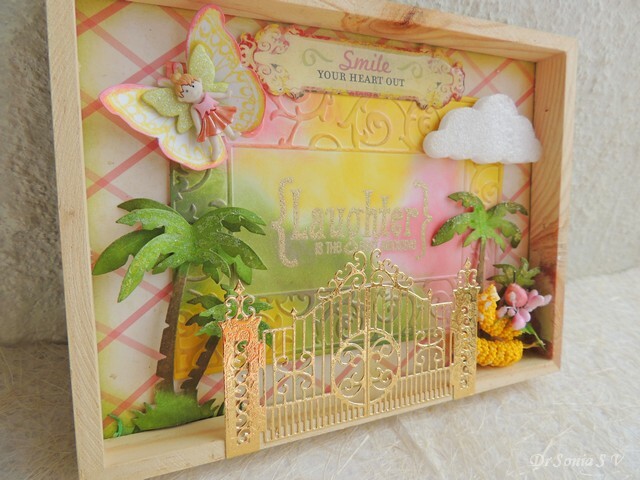 I don't know if there really are pink pears and big swirls of yellow berries in the real world but they looked yummy enough to add to my shadowbox! 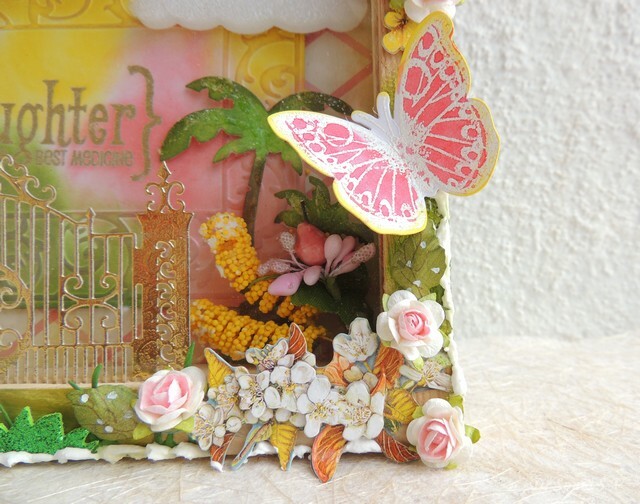 This beautiful golden gate is a Spellbinders die cut and I seem to want to add to every project [ you can see it in our Snail diorama too] ...do you do that too...use a new craft supply in a near obsessive fashion...? 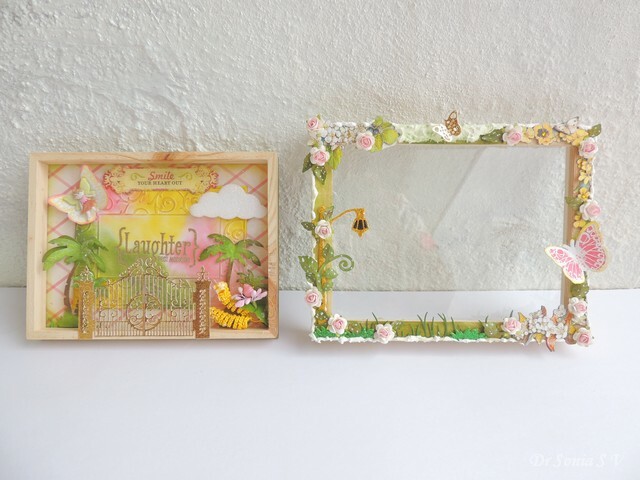 The picture above shows the shadowbox elements and the wood- glass frame I dressed up to go on top . Hi friends first of all Thank you so much for the supportive comments on my last post where I confessed to struggling to manage my online presence. I am staying away from Facebook and put in my resignation from DT commitments [No I didnt have a ton of DT commitments but just one!] and it does seem to have done wonders to ease the pressure. 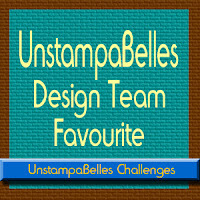 My regular readers will be used to seeing occasional "weird" blogpost headings from me isnt it ...? 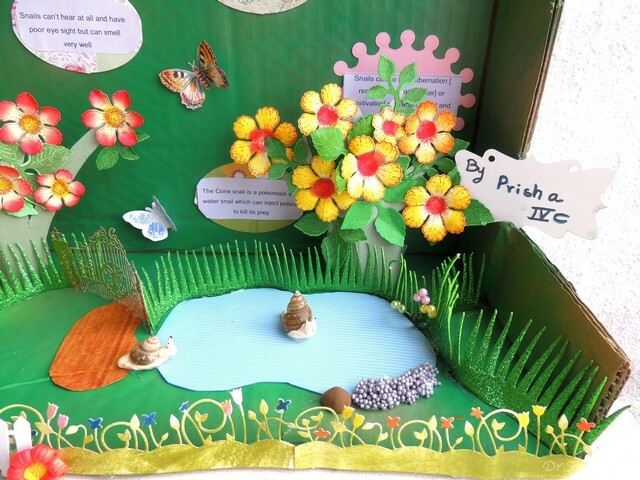 well you guessed right this Snail Habitat Diorama was made for my daughter to take to school. My daughter is in 4th grade now and they are learning about snail habitats. They were asked to try and bring snails to class.Though I am very squeamish about anything slimy and crawly, like a dutiful mom I ventured out into our garden, the marshy neighborhood locations and even a nearby lake to search for the little snails!My daughter was so disappointed we couldnt catch any snails but cheered up considerably when I agreed we could make a 3 D diorama instead to take to school! 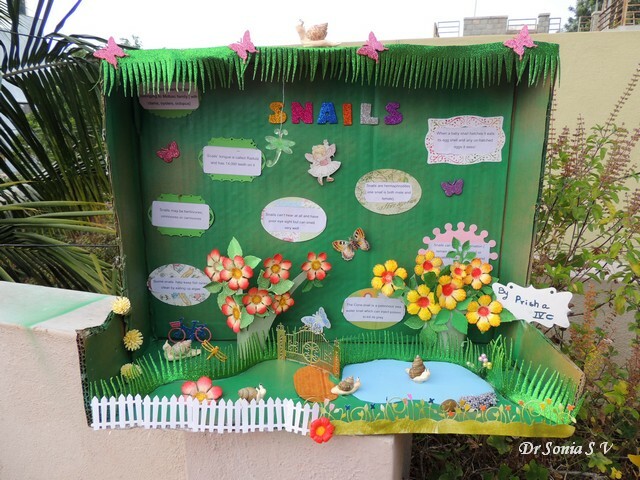 I cut up a large flat piece of cardboard , scored , bent and glued it to form the diorama base with a tall background to accommodate all the snippets of information we had printed about snails. There was no time for proper painting so I had to speed things along by whipping out my green spray paint bottle to cover the kraft colored cardboard base! 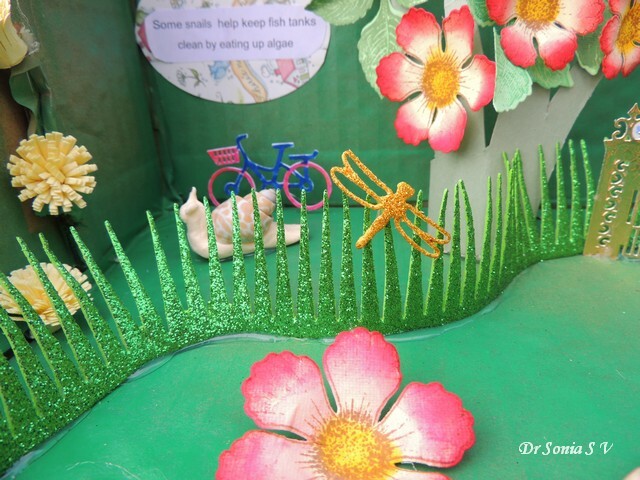 A garden needs a few critters and my daughter added a golden foam dragon fly on the grass and of course she wanted her garden to have a bicycle just like her real one in pink and blue! 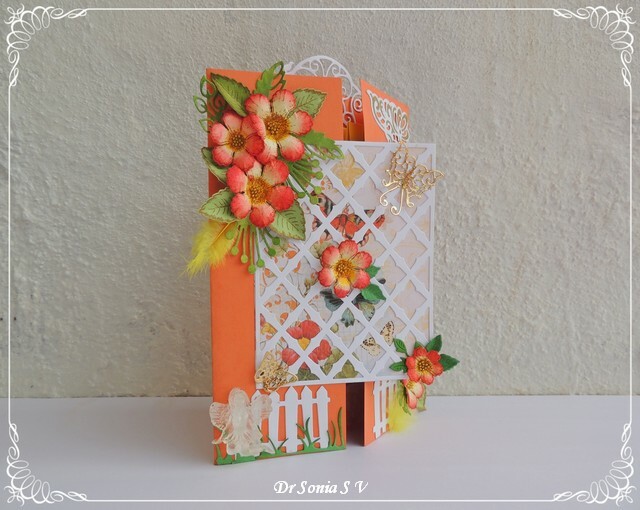 I debated whether the golden gate was too stylish for our humble garden but I couldnt resist adding it! My 9 yr old made all the snails using air drying clay and real snail shells we had found at the lake bed . I think you will agree her clay snails turned out rather well with their cute tentacles and tiny eyes! 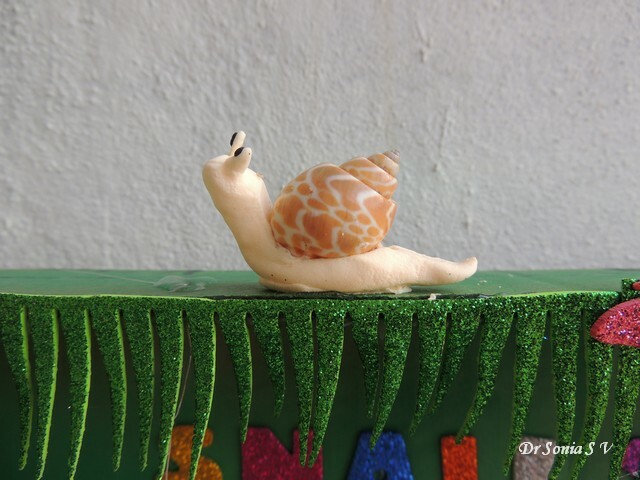 Snails secrete a slimy trail to help them to slide along and my daughter was delighted our faux slime made using the glue gun turned out super! 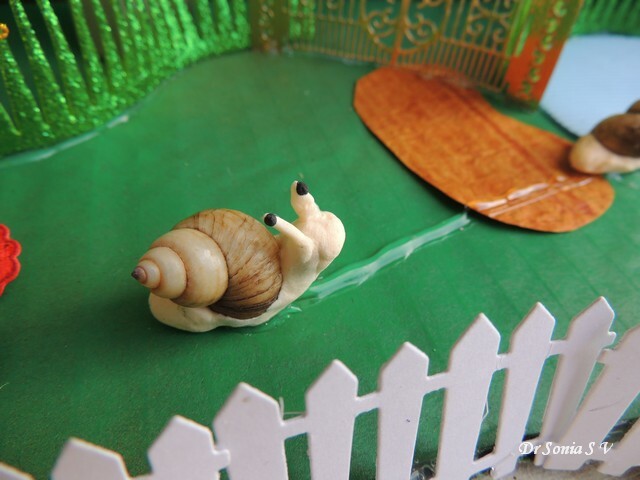 Land snails love cool damp places and so we added a small pond [using textured foam] in the garden and you can see 2 snails enjoying themselves in it! The purplish black heap you see on the bed of the pond is foam putty ...love how it looks like pebbles and the brown rock was sculpted by my daughter using clay. 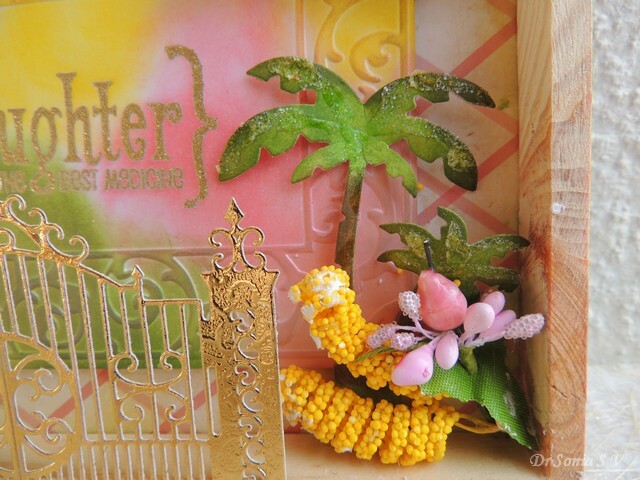 [You can see more foam putty projects here : Altered Heart tutorial and Texture Media Experiments] She also colored the Memory box spring border die cuts we added to our diorama. 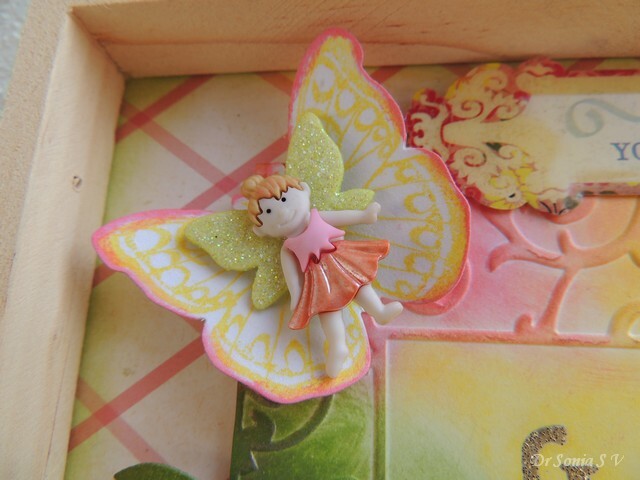 And here is a closeup of the little fairy who keeps the little snails company ! 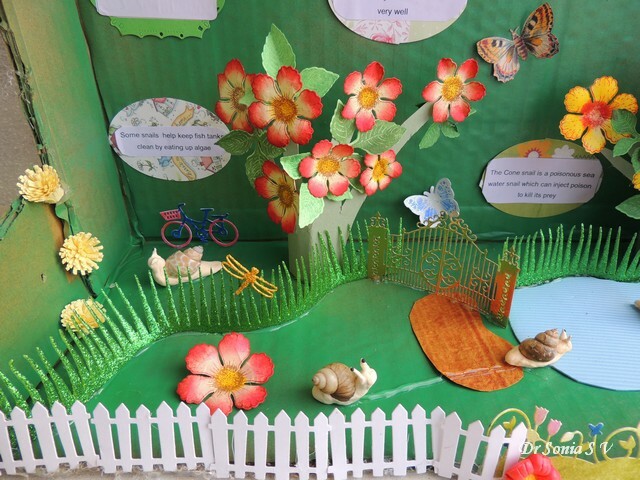 And yeah our snails's garden habitat has lots of butterflies fluttering about! 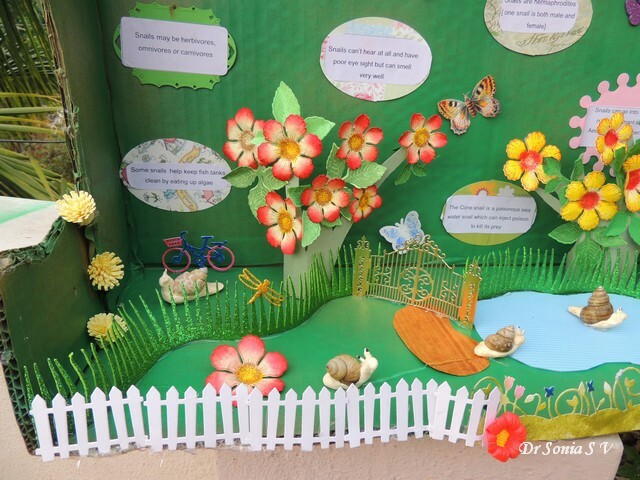 Our Snail Diorama was an extremely hurriedly put together project but my daughter loved it and was thrilled she had something to take to school!! The funny thing was the next day morning my hubby was able to find quite a few real snails wallowing in the rain drenched mud just outside our home!! 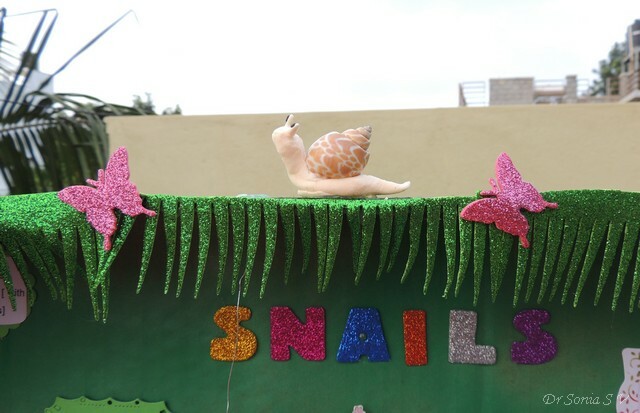 My daughter's excitement knew no bounds at being able to take a 3 D project as well as real snails to school! 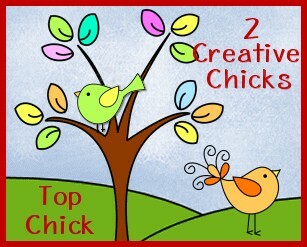 And yes both were a huge hit in her class!! 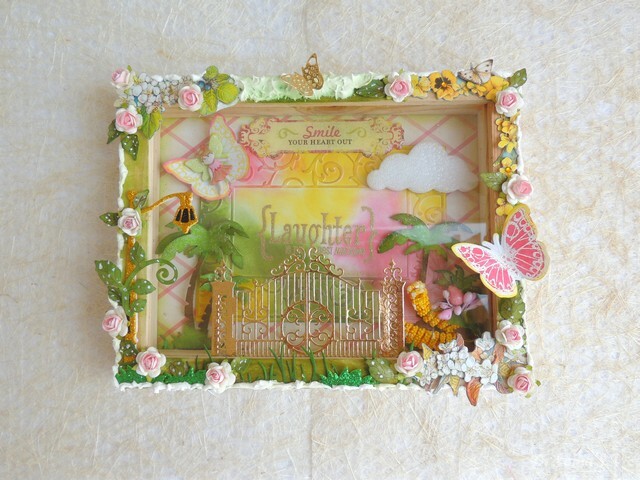 Supplies : Dies : Spellbinders Guilded Gate, Spellbinders Alphabets,Spellbinders Label , Spellbinders frame, Spellbinders beaded Oval, Sizzix Grass, Memory box spring border ,Marianne Fence, Cheery Lynn dragonfly,Cheery Lynn bicycle, Sizzix scallop oval, Provocraft butterfly, Sizzix Butterfly stamp - die set, Heartfelt creations Classic Leaf . 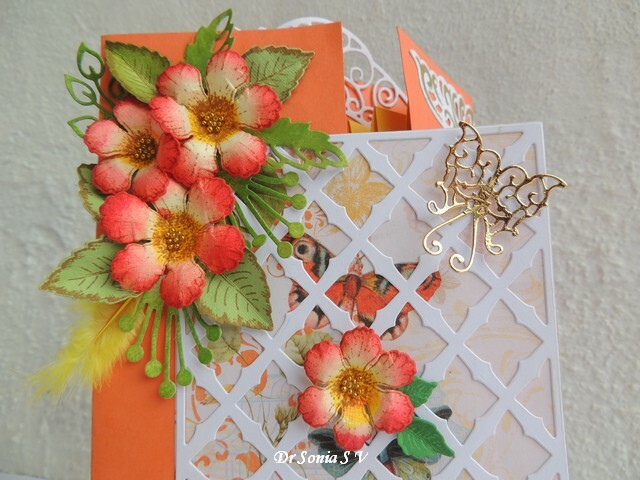 Heartfelt creations Botanical wings- rose die stamp set, Memory Box fringe border, ECD Oval accordion.